This is Mathieu’s first full-length release for the Dekorder label after releasing two highly acclaimed 10” singles for the label in 2011. Layering a variety of instrumentation, both analogue and electronic, ‘The Falling Rocket’ is a lengthy release that as expected, is a wall of massive gliding ambience. A ghostly apparition of sound opens up this latest affair. Like a breathing fog of cold, dense aurora the pads drift through the speakers as ‘Lacaille 8760’ seeps gently into the room, whilst a foundation of rich tones carry the dense weight on their shoulders. As a whole, the album plays out in much the same way as it starts. 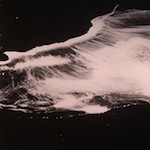 Rich, bass heavy drones are the glue, which not only holds everything together, but also has a strange, oppressive pull that gives the listener the impression they’re sinking into the ground. The light drifting wafts of air that parallels this provide two opposing forces; that of being held steadfast whilst your head wants to lift off your shoulders. It’s a fundamentally weird state to be put in and cleverly thought out. Occasionally the album screeches out noise when you least expect it. This once again comes when it’s needed most, as this release has the uncanny knack of dragging you into a hypnotic void where time becomes irrelevant. One for Dark Ambient enthusiasts the world over, ‘The Falling Rocket’ is a release that places Stephan Mathieu at the top of his game in a lot of respects.